Sorry for the Delay! The Utensibility roundup is due to be published on Tuesday at 7am PST. Please check back then for a comprehensive shopping list of the Home Cook's favourite tools. Whilst enjoying an appetizer of foie gras on a recent trip to Oola the waiter turned to Fred and quietly informed him in French, "If you want some really good foie, you have to try Monte Cristo Cafe, a new French restaurant that has only just opened". I duly noted the information and when Sarah of Delicious Life announced her latest Dine & Dish Challenge would be themed The Freshman - to review any eating establishment that's in its first year, I jumped at the chance to pay Monte Cristo, barely weeks old, a visit. Although we had no problem making a 9pm reservation for a Saturday night via Opentable, we weren't quite prepared for the huge, cavernous restaurant to be completely empty, save for one other couple. The difficult-to-locate 'Cafe' is situated in the bleak maze of an ugly, empty-late-at-night mall in the Embarcadero Centre. 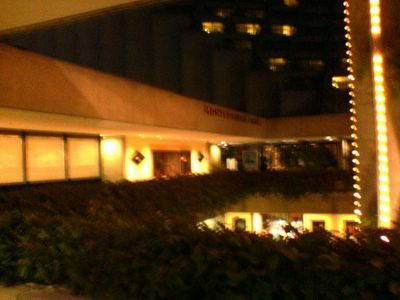 Other than Hyatt visitors from the adjoining hotel complex, walk-ins and passing trade are unusual here at night. Lunchtimes, benefitting from the large number of office workers in the area, are reputedly far more busy. Once beyond the attractive, carved wooden doors at the entrance, you find yourself a room that could almost be be mistaken for French ski-lodge style with its funky brick fireplace-style walls and huge picture windows affording a stunning view across to the Ferry Building and the Bay Bridge beyond. We are not sure if the decor is by design or inherited. It feels like the latter, but the result is interesting anyway. Lack of customers makes the atmosphere a little stiff in the dining room but some more boisterous activity in the adjoining bar ensures livliness is not totally lacking. The lady [manageress?] who shows us to our table is French and she and Fred have a polite little introductory conversation in their mother tongue. Ben our nice, but inexperienced, waiter explains to us that he is new and doesn't have a clue about the wine list, so we are left to peruse it whilst he fetches the apperitifs and the manageress[?] to help with our selection. When he comes back with my glass of champagne I am surprised that it tastes completely flat. Not a bubble in sight. I call him back and ask for a replacement. Next thing I know we have a visit from the head bartender himself, who has personally come to apologize and let us know that Ben is not in any way to blame for the previous, bubbleless offering. He is an amiable, talkative, Irish chap who has a fresh bottle of champers tucked under his arm which he continues to crack open infront of us as he makes small talk about why we, as Europeans, have all ended up living in San Francisco. As he chats he pours my drink in stages, waiting for the bubbles to settle, in between pours. His natural gift (of the gab), causes his attention to wander, and eventually he actually wanders off without remembering to finish filling my glass to the brim. I feel a little shortchanged with an expensive [Piper-Heidsieck Brut Champagne NV $15] glass of fizz, that is barely two thirds full. Having already grumbled about the original glass, I am loathe to create further fuss. Little do I know at this early stage in the proceedings, my skills at complaining are going to get plenty more practice as the evening unfolds. From the fairly classic French menu I decide on Ahi Tuna Tartar with Almond, Capers, Citron and Argan Oil 13 while Fred, of course, opts instead for the Foie Gras au Torchon with Peach and Thyme Gastrique Jus and Toasted Brioche 14 to start. They forget to bring any bread until after the appetizers have been delivered. I take a forkful of the fish and almost gag. It tastes overly fishy and off. On the other side of the table Fred is having a slower but similar reaction to his food. I call over the manageress[?] and tell her that the tuna tastes off. She rushes away to get a replacement. Fred is picking at his foie gras. It's awful, he explains, it tastes rancid, oxidised, like it's been left out in the fridge and accumulated a host of other stale flavours. Fred never complains in a restaurant, unless I encourage him, but when the manageress[?] returns with a new tuna appetizer for me, Fred explains his problem with the foie gras to her in French. She apologizes and tells him she is going to have a word with the chef. Fred is left peering at his Torchon. "I am not a man who ever leaves his foie gras", he says, "but I am not eating the other half of this". I try it and agree with him. It tastes rank and I am not surprised he does not finish it. For the rest of the evening, we never see the manageress[?] at our table again. The second round of tuna is actually not bad. I am nervous and a little paranoid about retasting it at first, but once I recover from any qualms about off fish I might have had it is a tasty rendition and generous portion of tuna tartare. We both choose the Bavette a la Shallots & French Fries with béarnaise sauce 21 as a main course. In contrast to our earlier disappointments, the steak and its accompaniments are absolutely perfect. Tender, tasty meat, cooked to our specifications and tinged with just the right amount of chargrill is bathing in a rich, brown sauce accented with sweet, soft shallots. The sauce also laps up against the crispy mound of much better than average French fries, softening some of them with its delicious flavour. This dish is nothing new, extraordinary, or ground-breaking - it is just classic, simple, good French food at its best. We wash it all down with a not particularly great bottle of Jaboulet Aine "Les Jalets", Crozes-Hermitage Rhone 2002 $45 from their fairly large wine list. Half way through our meal the music is turned up to ear-deafening proportions as a DJ and salsa fans start to gather in a room adjacent to the bar for an evening of dancing. We are used to loud music but this is so noisy I am almost incredulous that they should do this when people are trying their hardest to enjoy their dinners and carry on a conversation at the same time. By this stage the restaurant has gained a handful of other late night customers, including a new born baby, most probably tourists from the Hyatt hotel next door, who are similarly raising eyebrows at the increased volume. No one can hear anyone else speak, even if they shout, so Fred has to request they turn it down a little. He says doing so makes him feel like a grandpa. The bill arrives. Despite our disappointments throughout the evening, it looks like we are still expected to pay full price for everything, even the unacceptable foie gras that we never heard back about from the manageress[?]. There is no doubt, the bavette is great, but probably not great enough for us to forget all the other downsides of the restaurant and return to give it another try. The bill, including tax and tip was $170. In that not insignificant price range, and even for a good deal less, there are many fabulous places to have dinner in San Francisco, maybe even with a dessert thrown in too. From our visit, it looks like the competition is going to be tough for Monte Cristo Cafe. No other online reviews of Monte Cristo have been found at the time of writing. 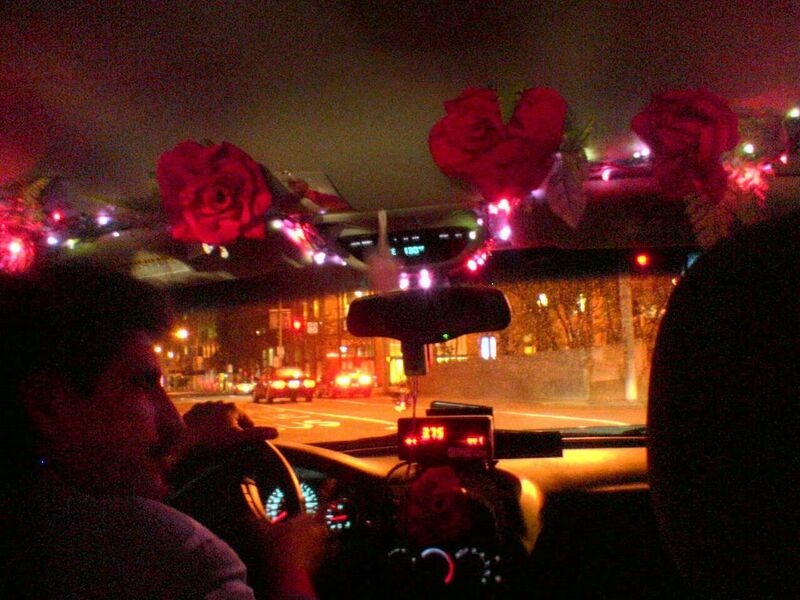 By chance, we caught the best ever Party Cab on the way home. The inside was decorated with roses and fairy lights. If you want a ride, call Denny on 650 906 7102. New places tend to be off the first few weeks. I'd imagine it's hard to plan how many diners, and easy to get too much fish and being stuck with it too long. Not that it is an excuse for bad food, but it's courageous of you to go early. Oh my... bad sea food and foie gras?! I have to admit, I gasped when reading your account! I dont know how they do it. They know what the food is and how long it will last who do they think they are fooling? Do they not respect the customers enough to realise that they know what "off" food tastes like? It was pretty bad - but despite the food and drink problems, the thing that really left a sour taste in my mouth was that they really must have known they hadn't performed adequately for us, but they didn't lift even a little finger to do anything about it. They didn't apologize for all the problems, show any gratidude for our patience, do anything to try and get us to return. They never returned with a response about the foie gras. They didn't even come and say goodbye as we left. They just gave up on us. Wrong people to give up on I guess. $170 Lord! that's a lot of money for a sub par meal. Every time I pass that location it is either a new restaurant or shuttered. Must be bad restaurant karma. omg, sam! today i am actually carefully reading through your post, and am so sorry about such a yuck meal! i mean i don't like fois gras at all, so if it was bad, damn, it must have been BAD! Oy, Sam... I've been hearing intermittent buzz about Monte Cristo, and have wondered how it would fare in that location. Sorry you had such a crummy dinner. Hello, I read your review of Monte Cristo Cafe with a heavy heart. I will be upfront and say that I am the wife of the Executive Chef and am very curious as to how the public is responding to Monte Cristo. Thank you for your candid and honest review. Since I have no official connection with the restaurant I will not serve as their apologist, however I assure you that I have printed out your review and accompanying comments for my husband to read. As with most new restaurants you should perhaps give it another chance and then compare your experiences. If you go again and have any complaints about the food, please ask to speak to my husband Chef Mickael Boussemart. Thank you. Kathryn - thank you for your response and especially for being so level-headed and reasonable. Also thank you for offering to share the post with your husband (even though it makes me nervous, I shouldn't be). Since I wrote the review, some others have appeared on Yelp too which seem less than complimentary too. I often give places a second chance even ones that have somewhat disappointed, at my own expense of course, but with Monte Cristo I just don't feel there was any spark at all, any reason to return and repeat the truly miserable experience it was. I think the problem was mostly on the management side. They could have done a lot to make us feel better. They did nothing. Maybe if I start to read lots of rave reviews sometime, I will give it another go, but until then I have much much better things to drop $170 on. My first time at Monte Cristo today, for lunch. The energy in the place was good as more folks turned up for lunch. The "wild salmon" dish was well presented, but was unexpectedly bland - tasted like uninterested (spelling correct) Atlantic salmon at best. The bean soup needed salt and pepper. And, after a loooong pause, the dessert, the "upside down apple pie" was a real treat - warm and full of flavor. Fortunately the person I was with was very good company. I am willing to give MC another try, but not with the soup or salmon.